When water damage hits your rental property, it’s tough to know what to do! The good news is, it is up to your landlord to handle the damage for you. 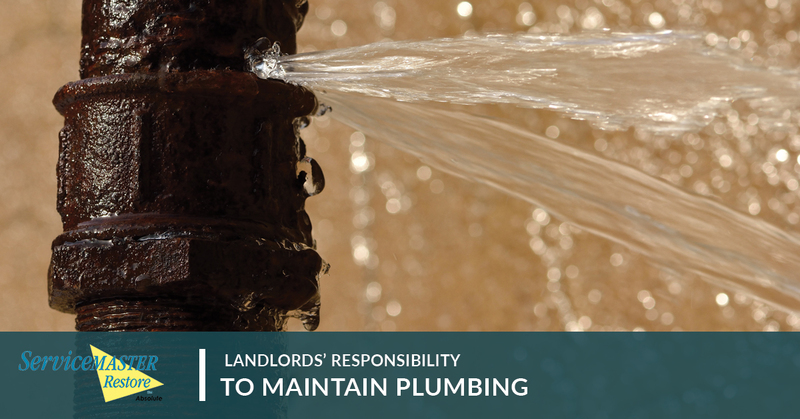 Keep in mind, though, that it is also your landlord’s responsibility to take care of your pipes and plumbing maintenance in your rental property anyway. They are obligated to do so legally under two different ideas. First, the lease requires it. Second, there is an implied warranty of habitability. Today, we are going to share your landlord’s duties to care for your home in the event of water damage. Many people think of a lease as a contract that keeps the tenant in one place, but this isn’t necessarily the case. The lease keeps the landlord in check, as well. In the typical lease agreement, the tenant pays a set fee (the rent) to live in a specific and habitable condition. As soon as that space becomes uninhabitable—such as when water damage occurs—then there is a violation of the lease. This means that the tenant has every right to get their landlord to fix the situation. While this isn’t a written contract, the implied warranty of habitability means that any unit rented needs to be able to be lived in safely. While that annoying dripping noise might be frustrating, it isn’t in the way of your life. However, when a pipe bursts and the room floods then your health and well-being are at risk. This space is no longer habitable due to health and safety issues. These problems need to be addressed. If they are not, some tenants can choose to pay rent into escrow until after everything is patched up. Your landlord is required to keep essential plumbing, like your sink and the toilet, in working order. However, if there is some sort of leak and your stuff gets damaged, then it might be time to talk with your lawyer. This usually means that your landlord didn’t check the pipes and plumbing systems to keep them up to date. If it turns out that the cause of the leak or burst was negligence, then the landlord may have to cover any of the resulting damages. If you have told your landlord about something not working, and the landlord ignored it, then the resulting damage to your stuff is going to be sitting on their shoulders. This includes property damage, as well. However, make sure that you also act carefully. It is your job to move as much stuff out of the way as possible to minimize the damage, as well as to contact someone to help you clean up the mess (such as SM Absolute)! Keep in mind that water leaks can happen without it being anyone’s fault. They can even occur when the tenant caused the problem, such as by keeping the heat too low and letting the pipes freeze and burst as a result. If the water damage wasn’t caused by the landlord’s negligence, then they may be able to avoid responsibility for the resulting damage. If you want to be sure who will handle an issue should water damage occur, look to California’s laws on the matter! You can also always choose to purchase renters insurance before an issue comes up. While this is not usually required in order to rent, it can certainly help you pay for your damage—especially if no one is at fault for the damage. Also, keep in mind that if the water damage is somehow your fault, your landlord is completely within their rights to charge you for the repairs. Know your lease thoroughly, and be ready to discuss it with your landlord if an issue should come up. If the two of you disagree about responsibility, it may be time to consider hiring a lawyer. Before you get tangled up in the mess of who is at fault, please take time to contact a team that can help! SM Absolute is here to help you solve your water damage issues. With experience in water cleanup, flood repairs, and more, we are the team to call. Reach out today to get started!